Home Cryptocurrency News LA Dodgers To Hold First Crypto Giveaway In Sports History. LA Dodgers To Hold First Crypto Giveaway In Sports History. 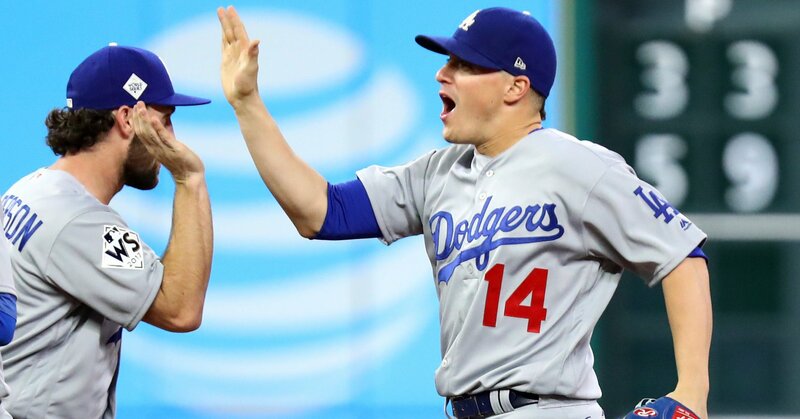 The Los Angeles Dodgers are entering the digital space with what they are calling the first ever crypto giveaway in both baseball and sports history. The team announced Friday that it will be holding Digital Bobblehead Night when the Dodgers host the Padres on Sept. 21. How does it work? The first 40,000 fans will receive a card with a unique code. Fans will then visit a website, where they can enter in that code and unlock a digital bobblehead which they can then download to their Ethereum wallet. Ethereum is a public blockchain network which uses the cryptocurrency ETH. When fans unlock their token, they will be randomly given a digital bobblehead of either Clayton Kershaw, Justin Turner (Above) or Kenley Jansen. Note that to download the digital bobblehead, however, you’ll need an Ethereum wallet first. Who else thinks this is a good way of engaging with the fans, or is it just a Marketing gimmick? Previous articleTesla Plunges as Musk Smokes Weed During Podcast, Accounting Chief Leaves Company. Next articleThe Next Bitcoin Bull Market, If History Repeats Itself, Then It Will Happen!